Computer security might not be something you think about a lot, but it's incredibly important. So let's go over some security measures you can take to help keep your data safe. 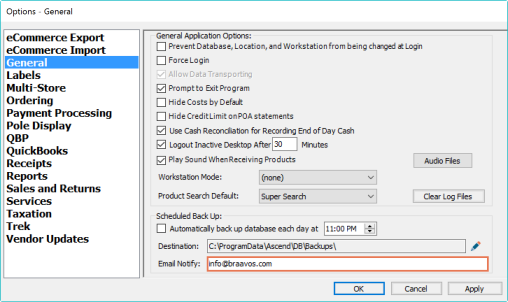 Your Ascend database backups are the only way to retrieve your sales history and retail data if your server ever crashes or becomes compromised. So it's really important to set up the automatic daily backups - and save them somewhere other than the computer. Using a secondary location for your backups ensures you can access your Ascend information in case of hard drive failure, natural disasters, or theft. Use an External drive. This option is good because it gives you access to your backups if the computer crashes... but since it's physically in the store and hooked to the computer, you'd likely lose your backups if there's a flood, fire, or theft. The best practice is to use a remote folder (such as the Cloud). This offers expanded storage and an offsite solution to keep your backups safe in case of damage to the store. Make sure your email is up-to-date in the Email Notify field of Options > General. Your Ascend system will notify you via email any time a backup fails to save to your designated location - as long as you supply a valid email address here. A majority of these updates are meant to address security concerns. So when you see those prompts, click Okay. Or select Ask me later if it's not a good time - and then set aside time to run those updates later! Make sure to use strong passwords for any account you access on the computer (such as email or social media). Really strong passwords typically have a combination of upper and lower case letters, symbols, and numbers. Usually, the more complicated a password, the harder it is for someone to gain unauthorized access of your account. This is also why you should not use the same password for every account. If possible, update your account passwords every few months, or with staff changes. 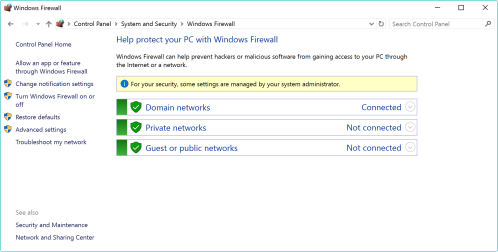 Your Windows Firewall should be active on all computers. You can check if it's active by right-clicking the Start menu on the the computer and selecting Control Panel > System and Security > Windows Firewall. If the icons are green, you're good to go! If they're not, you'll need to activate the firewall. Double-check that you're using a pop-up blocker when you're online. Most web browsers come with one. Not sure if your browser has it? Just navigate to your favorite search engine and type pop up blocker + [your web browser] to find instructions. When you do download something, it's important to read through the installation processes to make sure nothing "extra" is being installed on your computer. Your computers should be getting scanner for viruses and malware regularly. There are a lot of programs out there that can help protect your computer - including free ones! Take some time to figure out what program is right for you. Many Ascend users have reported issues with the antivirus programs McAfee and Norton, so we do not recommend using those. If you have wireless internet in your shop, and you want customers to have internet access, we recommend setting up a separate Guest network for them to use. Your computers should have a private network that is not shared with outside devices. And if you do not have a separate guest wifi, make sure you are not running Ascend over wifi on any of your machines.